You are buying the Mabis DMI Shower Transport Chair which is manufactured by Mabis DMI. Mabis is a leading manufacturer of Bath Seats. At ADW Diabetes, we do our best to offer the complete product line by Mabis at discounted pricing. 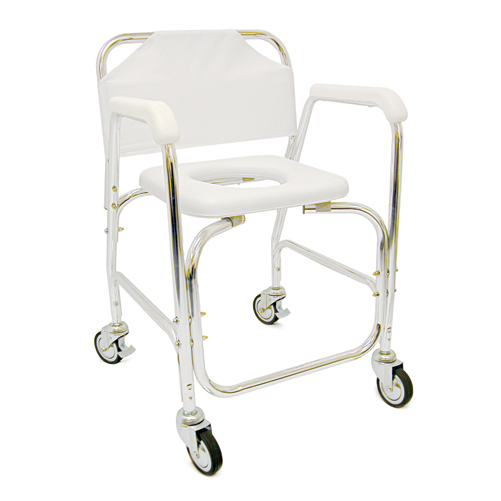 Designed with padded vinyl toilet seat, waterproof PVC seat back cover and plastic armrests for patient comfort.Made from sturdy 1" rust and corrosion resistant aluminum tubing.Rust resistant 4" ball bearing casters and rear wheel locks for safe effective patient transfers in and around the bathroom or shower. Quick and easy set up. This is a special order item that requires an additional 3-5 days for delivery. Express shipping options are not available for this item. We are unable to accept returns for these items once opened. If you experience technical problems with the item, please contact the manufacturer so they can assist you.